24 September, the HETE-2 satellite detected an intense burst of gamma radiation characteristic of the most violent phenomena in the Universe. It located the event within just 14 seconds and relayed the information to observatories on the ground. Astronomers call these explosions gamma-ray bursts. These bursts are so powerful that in just a few seconds they release as much energy as the rest of the Universe put together. HETE-2, a joint mission of the United States, Japan and France, is wholly dedicated to studying these phenomena, which occur when dying stars explode. In just a few days, the satellite detected 3 such gamma-ray bursts. For the short time it is visible, a gamma-ray burst gives astronomers a wonderful opportunity to study the formation of black holes, the appearance of the first stars in the Universe and star formation in the most distant galaxies. The jet of material produced by the burst only shines brightly for a few hours, lighting up the entire galaxy before plunging back into darkness. For scientists, a gamma-ray burst is also a sign of something occurring at a specific spot in the sky. But they are not quite sure what. We still do not understand the mechanisms that produce such a jet of material, which is only observed in one star explosion out of every 1,000. Are gamma-ray bursts caused by the death of a massive or very-fast-rotating star collapsing into a black hole? Many questions remain unanswered. Last year, HETE-2 observations established the link between gamma-ray bursts and supernovae, very short-lived celestial objects produced by exploding stars. They might therefore be signals allowing us to predict the appearance of a supernova. Closer study of a supernova also tells us how much energy is released and what type of star exploded. A supernova is only detectable a few weeks after its birth, so scientists are glued to their telescopes in expectation to observe any day now the afterglow of the 3 bursts in September. They are hoping at least one of the stars will start shining brightly to unveil its secrets. 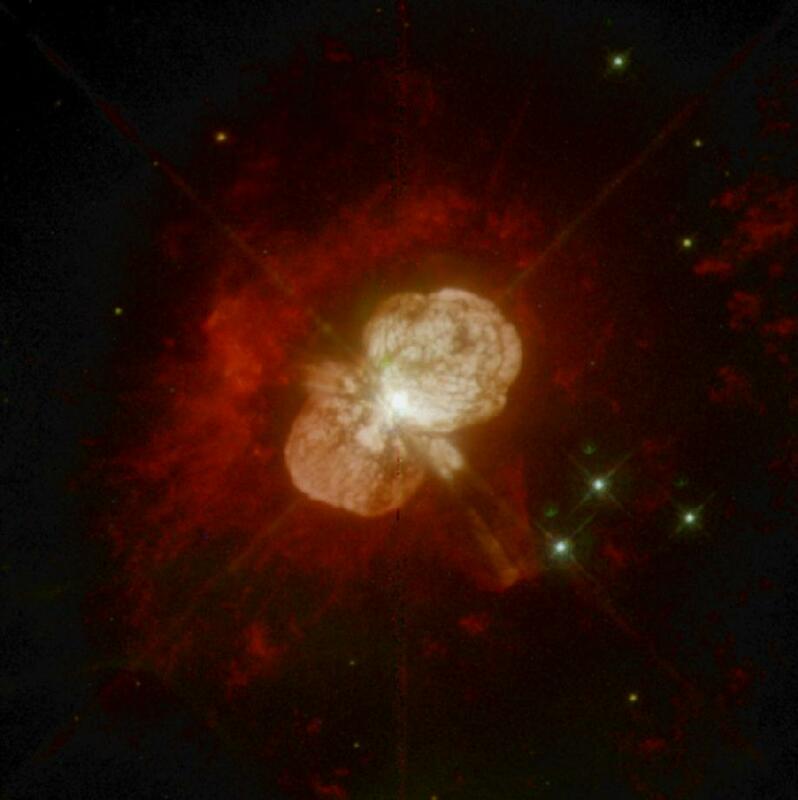 When a massive star dies it explodes, sending out a shock wave and blasting the material that surrounds it into space. For the next few days, the star "goes supernova", shining so brightly that it lights up its entire home galaxy. It then fades, leaving behind a vast nebula of material and a neutron star or black hole. If this happens, and if their theory is confirmed, gamma-ray bursts could prove an ideal pointer for researchers to predict star explosions and observe them fully. The jet of material from the gamma-ray burst of 24 September. The star fades gradually, but will it start shining again? In the days ahead, astronomers will be able to confirm whether gamma-ray bursts signal the appearance of a supernova. Images taken by George Kosugi with the Japanese Subaru telescope.